Home › Latest News › Ladies-only Garage Party 2017! Every year, we host a ladies-only Garage Party with the intent to equip and inspire the women in our local community. Ladies from all walks of life are encouraged to join in the fun! Second up was our guest speaker, Natasha Lyon, a local badass babe that runs her own security company and boxing promotions company while being a single mom! Natasha sums up her view on life: “I feel that if you are passionate about anything in life, you should be driven by that gut feeling and step into it, pursue it with all you have and push past the little fears of the unknown and of any challenges that may lie ahead of you”. Thank you for inspiring us! Our second demonstration was by none other than SA’s current K1 Kickboxing Champ in her weight division, Julien Esterhuyzen. Julien demonstrated simple but effective self-defence tactics to use if being attacked. This information is invaluable for women (and men!) in today’s society. Julien also shared a bit of her journey with us and what it has taken for her to get where she is in her sport. Well done on your achievements, Julien! The last demonstration came from our very own chrome consultant, Patricia Burger! Patricia showed the ladies how to lift your bike if it has been dropped. She stressed the point that these tactics are only to be used if the bike is not leaking oil/ petrol and if the ground below is flat enough to safely lift the bike without it sliding/ rolling off. This information is also invaluable as the time may come when, as a lady, you drop your bike, and there is no-one around to help lift it. Thank you for all your heavy lifting on the evening, Patricia. And well done to the ladies who also gave it a try afterwards! Before and after the event, attendees were able to take a spin on our Jumpstart! The Jumpstart is a machine that holds a motorcycle in place while being ridden so that the bike’s wheels spin on belts. This allows the rider to experience riding a bike without the fear of it falling or any prior riding experience. What a great opportunity! Our two vendors, Goji Spa and Pure Romance spoiled the ladies rotten with product sampling, massages and much more throughout the evening. 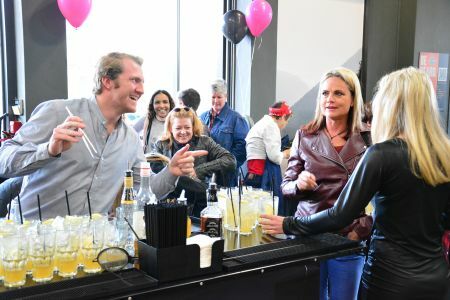 The Garage Party would not have been the success that it was without our incredible sponsors, who aligned themselves with the idea of equipping women in our community and added value to the evening by spoiling attendees! Thank you to Jack Daniels for providing goodie bags, items to fill them, the welcome drinks for the evening and for arranging the cocktail demo! cause and donating gorgeous spot prizes! For all your household and décor needs, you can view their range on: https://www.trendiy.co.za/ or give them a call on 021 914 1962. Thank you to Satiskin, who support our Garage Party every year and kindly donated travel-sized body washes for each goodie bag again! Thank you once again to our guest speakers for making it a memorable evening and last but not least, a thank you to our team at Tyger Valley, who put in the extra hours to make sure that everything ran smoothly!